Taichung, December 18, 2017 - NPB East won the tournament with a 4-1 win against Korean Baseball Organization (KBO) in the championship game in Taichung. NPB East had eliminated Japan Amateur Baseball Association (JABA) winning, 2-0, the semi final. KBO had qualified for the final beating, 5-2, CPBL. JABA claimed third place beating, 4-3, CPBL in the third place game. The AWBL is a largely developmental league for younger players and up-and-coming prospects. It is an opportunity for players to showcase their ability, to work on specific skills, and to hone various areas of their game. The one noticeable absence from this year’s teams was the Chinese Taipei National Developmental Team (college team), who have elected to disburse its players amongst teams participating in the revived Popcorn League -- an industrial league featuring nine teams that play 35 games each. The Europe/USA farm team was an old team with a new twist. Usually comprised of just players from Europe, the team is being selected by the WBSC this year and added US players (18 of them, most notable are Clayton Mortensen and Jack Murphy) to its roster during the three-plus weeks of competition. Similar to the CPBL squad, the rosters from the other teams were filled with high draft picks and national team players with lots of international experience. 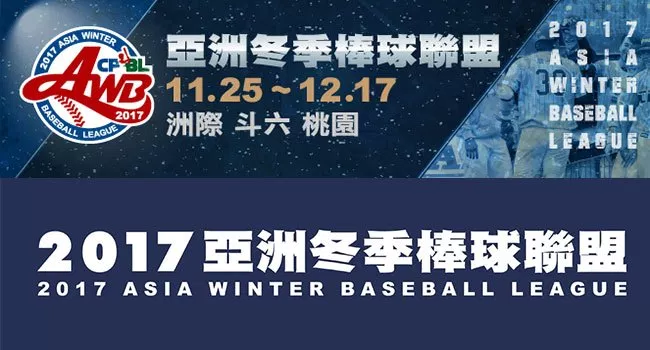 Each team played 17 games, from Saturday, November 25 to Thursday, December 14 at Douliu Baseball Stadium (14 games), Taichung Intercontinental Baseball Stadium (30 games), and Taoyuan International Baseball Stadium (seven games), prior to three days of playoffs in Taichung, December 15-17, to determine the league champion .